Two atheists and a minimally observant Jew have recently teamed up on a $100 million research and development project aimed at designing a fleet of tiny spacecraft that would take only twenty years to reach the nearest stars and photograph their planets. Ancient priests and prophets looked up to the sky in the belief that the sun and stars were the celestial abode of God and the angels. Today scientists and tech billionaires look to the stars of our earthly heaven—the vastness of space—with similar thoughts on their mind: Are we all alone, or do we have company out there? You see, this massive new scientific and technological initiative, along with several other recent big-ticket privately funded programs, are driven by the hope of discovering extraterrestrial life. The Breakthrough Starshot Initiative, announced in New York on March 12, 2016, is the latest of the Breakthrough Initiatives sponsored by Russian tech billionaire Yuri Milner. In a fascinating article at Wired.com, “How Russian Tycoon Yuri Milner Bought His Way Into Silicon Valley,” author Michael Wolff asked Milner how observant he was as a Jew. Milner replied, “Very limited.” Yes, he attends synagogue. But apparently his religious life doesn’t go much farther than that. The other two members of the Breakthrough Starshot board, world-famous physicist Stephen Hawking and billionaire Facebook co-founder Mark Zuckerberg, are both atheists. For tech billionaires and physicists alike, beyond making buckets of money and discovering the scientific secrets of the cosmos, there is a deep yearning to reach out and discover life beyond our little planet orbiting a small star tucked toward the edge of a rather ordinary galaxy among billions of galaxies and trillions of stars in the universe. It is a yearning that is almost . . . spiritual. Milner, Hawking, and Zuckerberg—together with an impressive array of leaders and advisors from the arenas of science, technology, and advanced education—believe that the recently announced Breakthrough Starshot Initiative represents the next giant leap in human exploration. With current rocket technology, it would take 30,000 years to reach the nearest star. Breakthrough Starshot aims to cut that down to a mere twenty years! Of course, it won’t involve getting humans to neighboring stars. But it would send us back a wealth of images and information about the solar systems and planets in our galactic neighborhood. Here’s the basic idea: A tiny, wafer-thin “StarChip” spacecraft about the size of a postage stamp and weighing only a few grams would be attached to an ultra lightweight solar sail a few meters wide. But instead of being propelled by light from the sun, it would be propelled by a powerful earth-based laser array placed at the top of a remote mountain range in South America, where the air is thin and atmospheric interference is minimized. Hundreds of these “nanocrafts” would be carried into high earth orbit by a mothership. Once per day, the mothership would deploy a single spacecraft. 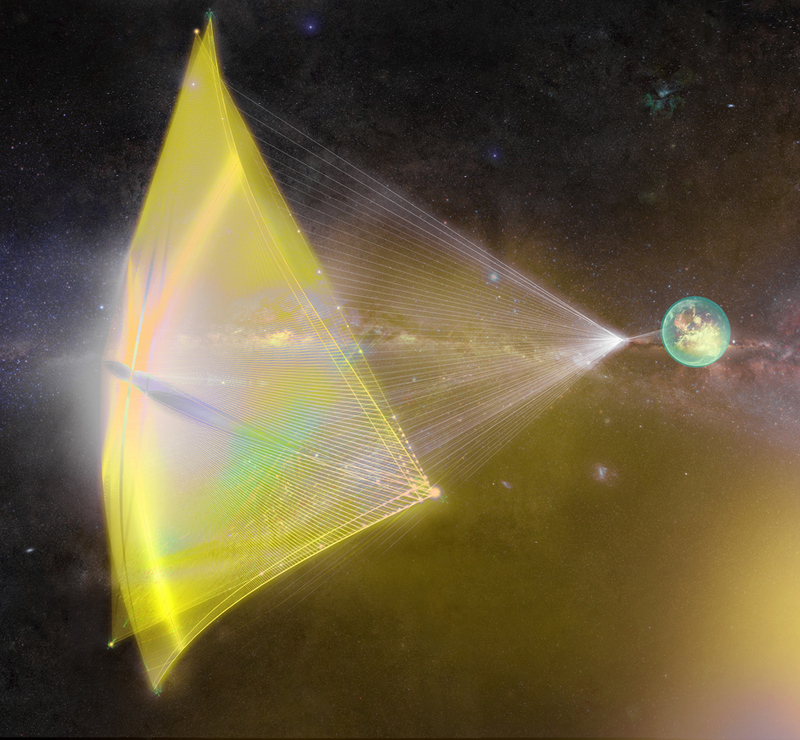 The laser array would then focus 100 gigawatts of laser power on the solar sail, accelerating it to 100 million miles an hour—about 20% of the speed of light—in only ten minutes. At that speed, the spacecraft would reach Alpha Centauri, our closest star (actually a three-star system), in about twenty years. As it whizzed by, the spacecraft would snap pictures, gather data, and send it all back to earth with laser communication technology built into the nanocraft, using the solar sail as an antenna. Sending hundreds of these miniature explorers to the same destination would provide greater assurance that at least some of them would be successful. It’s an elegant system. Designing it will push the limits of our technology. And building the full system, Milner estimates, would cost a cool $10 billion. However, if the technical challenges can be overcome and the money raised to build and deploy the system, it would then be relatively inexpensive to continue sending whole fleets of these nanocrafts to dozens, or even hundreds, of nearby stars to search for signs of life on other worlds. You can read an in-depth article about the Breakthrough Starshot Initiative at The Atlancic: “Inside a Billionaire’s New Interstellar Mission.” For additional video, including a speech delivered by Stephen Hawking at the project unveiling event, see “Stephen Hawking Helps Launch Project ‘Starshot’ for Interstellar Space Exploration” at Space.com. The Breakthrough Starshot Initiative is the latest entry in a long history of efforts collectively known as “SETI” (the Search for ExtraTerrestrial Intelligence). Though scientific SETI projects go all the way back to the late 1800s, the invention of radio telescopes in the early 1900s led to a whole new chapter in the search for advanced civilizations beyond our own solar system. The idea is that if there are intelligent beings living in other solar systems, they should have developed the ability to transmit radio signals similar to our radio technology here on earth. There’s only one problem: After listening for nearly a century now, we still haven’t heard a peep. There are an estimated 100 billion galaxies in the universe, averaging perhaps 100 billion stars each. The likelihood that there are other advanced civilizations in the universe should be quite high. There should be radio signals from other advanced civilizations criss-crossing our own galaxy. Yet so far, all we’ve heard is a deafening silence. Are we really all alone as intelligent, self-aware beings in this incredibly vast universe? Is there nobody else out there for us to make contact with? When we hear the words “science” and “technology,” we commonly think of computers and the Internet, space ships, medical research, robots, genetic engineering, and so on. What probably doesn’t come immediately to mind is making friends. And yet, that’s really what SETI is all about. How did life developed in the first place? How common (or rare) is life is in the universe? Is life something that the universe does as a matter of course, or is it just a fluke here on our planet? But what the big proponents of SETI really want to know is whether we’re all alone in the universe, or whether there are others out there whom we can meet, make friends with, and share the richness of our respective cultures with one another. That is the driving motive behind Carl Sagan’s well-known 1985 science fiction novel Contact, whose plot involves people from earth making contact with an extraterrestrial civilization. Carl Sagan (1934–1996) was an agnostic. If he had any concept of God, it was the pantheistic idea that God is simply the sum total of the universe. 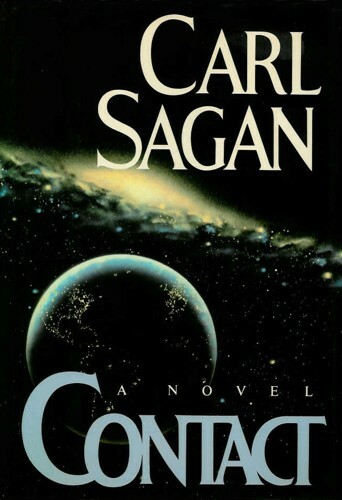 In other words, for Sagan, spirituality is the very human experience of awe at the vastness, intricacy, and beauty of the universe in which we live, and the powerful emotions we feel when we encounter the emotions expressed by other human beings in art, music, and literature, and in lives that show selfless courage. In short, for Sagan, spirituality exists in the realm of human thoughts, emotions, and relationships with other humans and with the cosmos in which we live. Sagan was one of the greatest proponents of SETI. And in his view, the search for extraterrestrial intelligence is a highly spiritual endeavor. It is an expression of our yearning for relationships with other intelligent, self-aware beings with whom (we hope) we share this universe. And who am I to argue with Carl Sagan? More to the point, despite Sagan’s lack of belief in any traditional idea of God, I think Sagan was onto something in his view of spirituality. It is common for people to think of “spirit” as something wispy and ethereal that lacks solidity and substance. The afterlife is often conceived of as a place where we exist as ghostly, disembodied beings who waft around ethereal realms as pure consciousness and pure energy. Spirituality is not some navel-gazing communion with our inner soul. It is a network of relationships of mutual love, understanding, kindness, and service with our fellow human beings, and with the world in which we live. That’s why I’m excited about the Breakthrough Starshot Initiative. It’s unlikely that I’ll live long enough to see those first transmissions start arriving back from a fleet of nanocraft shot on beams of light from earth to Alpha Centauri. But I am excited for coming generations of people on earth who may be the first to receive solid, scientific evidence that we are not alone in the universe—that there are others out there with whom we may one day form relationships of mutual love, understanding, and service. This, I believe, will represent a giant leap forward in the spiritual life of humankind. Awesome stuff! This subject gives us a lot to ponder. If scientists found even simple life forms somewhere besides Earth it would be historically groundbreaking. If other PEOPLE were discovered inhabiting another world I wonder how humans here would react in a religious sense. I imagine some might have their faith shaken just a bit. Being familiar with Swedenborg’s “Earths in the Universe,” it wouldn’t changes my views – but I might still be surprised that we found them. I’ve often imagined the great distance between stars as being a bit of a safety buffer. Humans here have a good track record of meeting new (and usually less advanced) cultures and messing things up quickly. The many Native American tribes that once lived here would likely agree. Of course discovering intelligent life in the universe and interacting with that life are two different things. I can only hope that if we do, that we’ll have matured enough to not make a mess. God is certainly too infinite for a human mind to fully comprehend, much like the universe itself is infinite as far as our science can tell. It makes sense then that God wouldn’t stop with one little planet. He could make a few more, or possibly an infinite amount more. But do you think it’s actually possible (or allowed) that the people of our world could one day be in contact with an extra terrestrial civilization in this material life? Yes, this is one of my favorite subjects! A little esoteric, I know. But I do think that if we discovered life, especially intelligent life, on another planet, it would bring about a huge change in human culture—probably even greater than the change brought about by the first pictures of the whole sphere of planet earth from space (see the opening section of: Seasons of Life). About how people would react from a religious perspective, here’s a fascinating article that I linked in the Aliens vs. Advent article: Could religion survive contact with extraterrestrials? by Damon Linker. I have similar thoughts about the vastness of space providing a buffer zone to prevent materialistic cultures such as ours that develop science and technology from contaminating more spiritually oriented cultures (as Swedenborg generally conceived of them) on other planets. I’m very glad that there are not people on the other planets in our solar system, as Swedenborg thought there were. We would have pushed hard to get there, and would probably have had just as disastrous an effect on them as we did on the tribal cultures that European explorers discovered in earlier centuries during the age of exploration of the earth. However, that very example suggests to me that there is no hard-and-fast rule preventing us from finding and encountering civilizations on other planets. In Earths in the Universe Swedenborg describes explorers from earth in the spiritual world traveling to the areas of heaven inhabited by people from other planets, and generally causing quite a ruckus there—in this case not due to technological, cultural, or viral contamination, but due to doctrinal contamination with the false doctrines of traditional Christianity, which the people from other planets found quite disturbing and repugnant. Swedenborg and his small group of earthlings encountered some resistance in their own spiritual interplanetary travels because of earlier visits by less scrupulous people from our planet. I have the same hope that you do: that by the time we actually reach and communicate with intelligent life inhabiting other planets in the universe, we’ll have matured enough that we don’t muck things up too badly. With the technology currently on the horizon, it looks like it would take at least hundreds, if not thousands of years for us to actually travel in person to another solar system. Perhaps that will be enough time for us to settle down and quit being such idiots. Related to all this, I tend to think Swedenborg may have been right in his solution to the Fermi Paradox a couple of centuries before Fermi propounded it. According to Swedenborg, the people of the other planets he encountered had not developed science and technology because they were not materialistic the way people from our earth are. They lived simply, and focused more on spiritual matters than on the material matters that science studies and technology harnesses. If he is right, this would explain why, if life should be fairly common in the universe, we so far have not detected any radio communications from an alien civilization. The absence of radio signals would not mean an absence of intelligent life elsewhere in the universe, but an absence of intelligent life interested in developing science and technology. It’s almost an article of faith in scientific SETI circles that extraterrestrial cultures would naturally develop science and technology as we have. But that’s an assumption based on the only intelligent life we have any experience with so far: our own. And even now on this earth, there are still a few isolated and protected cultures that do not use our science and technology, but continue to live in their old tribal ways. There’s no reason this couldn’t also be the case for cultures inhabiting other worlds. Though based on Swedenborg’s descriptions I tend to think the people from other worlds are more intellectually and spiritually advanced than the remaining primitive cultures on our earth. The people from other planets that he encountered were quite capable of carrying on intelligent conversation about complex spiritual and doctrinal issues. If Swedenborg is right that the other intelligent races in the universe don’t develop science and technology (and there’s no guarantee that he is right), then even if the Starshot project did discover strong evidence of advanced lifeforms on planets orbiting nearby stars, there would be no way for us to communicate with them until we physically set foot on their planets—which, as I said earlier, will likely take us hundreds or even thousands of years once we develop spaceships capable of intersteller travel. As great as it is in science fiction, faster-than-light travel such as Star Trek’s “warp drive” seems somewhat unlikely any time soon—if it ever becomes possible. So once again, if Swedenborg is right, it will likely be at least a few hundred more years before we can actually establish any communication with an intelligent civilization on another planet. Perhaps that will be enough time for us to settle our differences here on earth and act like mature human beings who are able to interact with other civilizations without fighting them, competing with them, or corrupting them. I think it’s highly probable that some form of alien contact has already been made! It’s just that we’ve not been told that it has happened. SETI for the most part IMO is just a smokescreen to give the general masses the impression that the scientific community is making a valiant effort to discover alien life forms. The creation of SETI was inevitable IOW to satisfy the vacuum so to speak. “Radio signals” are so galactically passé anyway! Well that’s my take from Mothership Terra Firma. Well . . . . of course I’m aware of the government UFO cover-up conspiracy theories. But as I said in the Aliens vs. Advent article, I don’t go for that stuff. For one thing, I simply don’t believe government is that competent. Not to put too fine a point on it, but when has any government ever been that good at doing anything?!? And now we’re being asked to believe that a whole series of governments around the world—the U.S., Russian, Chinese, European, Japanese, and the governments of other nations that have participated in earth’s space program—have all colluded in a giant, hugely successful conspiracy over many decades to deceive the entire population of the world? All this when these nations are frequently at war with each other and consider each other to be bitter enemies? No, for me, the UFO cover-up conspiracy theories simply don’t fly. However, just to be fair, for a serious student of Swedenborg who does believe in the cover-up, and believes that we’ve been visited by UFOs, and so on, head over to Doug Webber’s blog: Spirituality, Dreams and Prophecy. There you’ll find it all: aliens all around us, and a major conspiracy to keep the public ignorant of it. I have debated Doug on this subject both on various posts on his blog and in the comments section of my Aliens vs. Advent article. So if you want more of my reasoning as to exactly why I don’t buy the conspiracy theories, head over to the comments section there and read your way through it. And if that brings up any further comments or questions, feel free to post away! Set course and engage at maximum warp! Or in this case about 20% the speed of light. I was thinking about SETI’s search for radio signals, and it occurred to me that here on this world we’ve only had radio for just over a hundred years. Radio transmissions travel at the speed of light, correct? So even if another planet’s civilization was advancing a rate equal to ours, it would have to be within 100 light years distance to us to receive the signal. I personally don’t believe in alien spaceships visiting this planet. As big of a sci-fi fan as I am, it would be amazing to witness something like that. But I just don’t buy it. The accounts of other earths from the spirits that Swedenborg met seemed to describe worlds that were less advanced scientifically than even our own 18th century. As I recall, he even made reference that the people of this world were much more concerned with such knowledge than those of other worlds. They were more concerned with spiritual ideas. The European explorers we mentioned earlier almost always were more advanced than those they discovered abroad. I would image that when we do find ET, it will be the same case. WE will be the aliens in spaceships visiting from another star. Yes, radio signals travel at the speed of light. So it’s as you say: if another civilization were advancing at the same time and rate as ours, it would take as many years for their first radio signals to reach us as they are light years away from us. I recall hearing (but wouldn’t swear to it) that our sun is a third-generation star, meaning two previous generations of stars went nova or burned out and spread some or all of their materials out into the nebula that our sun formed from. This, so the theory goes, is where the heavy elements that formed our earth and the rest of the rocky planets came from. A first generation star would not have the heavier elements available from which to form a solar system with rocky planets. So one possibility is that the universe is still in the early stages of forming planets capable of supporting life. It could be that our earth just happens to be one of the earliest life-bearing planets in the universe. However, in the last decade there’s been a lot of new discovery of planets around other solar systems, so I suspect that our theories have been heavily revised since I last did much reading on the subject. It does seem a bit unlikely that we would just happen to be the first planet to have intelligent life, so that there aren’t any other equally or more advanced civilizations out there—or if there are, they’re so far away that their radio signals haven’t yet reached us. I think scientists are skeptical of that, and think that if there are technologically advanced civilizations elsewhere in the galaxy, their radio signals should have been traveling toward us and passing through our solar system for thousands of years by now. I’m still inclined toward Swedenborg’s theory that people on other planets simply haven’t bothered to develop technology because they’re not all that interested in material things. And yes, the level of technology on the planets Swedenborg described is definitely not up to the level of our 18th century—which was Swedenborg’s own era. They did live in simple dwellings, and some of them seem to have had agriculture and domesticated animals. So they seem to be at the level of some of our earliest agricultural societies, in which technology was quite low, and certainly not at a level to use radio technology, which didn’t develop until the 19th century here on earth. If Swedenborg is right about this, then yes, we would be the ones visiting other planets in spaceships, and blowing their minds! Or it’s possible that they’d have advanced warning from spiritual sources. Most of them seem to still have open communication with the spiritual world, as the earliest human cultures on earth did according to Swedenborg. So news could travel to them via recently deceased people from our earth that those crazy earthlings are starting to travel physically to other planets in the material world. Of course, such early agrarian cultures would have no way of knowing that we’ve flung hundreds of nanocraft their way. Even if one managed to be so on-target as to hit their planet’s atmosphere, considering its very low mass it probably wouldn’t even register as a shooting star. Then again, maybe one of those nanocraft would make a splash if it hit the atmosphere of one of the planets at the other end. See: Ask Ethan: Could an atmosphere slow down a runaway spaceship? Of course, any residents of the planet still wouldn’t know what made that big flash. I remember vividly remember when I saw what I consider to be one of the greatest films of all time….. The Day the Earth Stood Still (the original btw). I wonder Lee, if you’d consider someday writing a sort of “correspondence article” ala Swedenborg on the spiritual implications of this movie. I believe now as I did intuitively then that the release of TDTESS was a curious thing as it had a unique profoundness to it that well transcended the time it was made and its still relevant profoundness even until today. War of the Worlds of course was hugely influential then too. I think there are subtle undertones to TDTESS however that involve justice, undying love, combined with the native awe (and fear) that we may not be alone. But the most profound aspect of it IMO was indeed that an advanced alien civilization was not only technically far superior but ALSO essentially spiritually far more advanced as well! To wit, The God-like love, the inherent gentleness of the alien, and his love of peace. It makes you want to see it again just for the scene where the alien gives the boy diamonds. Diamonds to me here were symbolic of something else in the sense of spiritual gifts perhaps? UFO’s I agree are not likely ‘real’ btw simply because I believe God wouldn’t allow the interference. But they aren’t real to us solely for that reason and yet they may indeed still exist out there. Ah, The Day the Earth Stood Still! I’ve watched it a number of times over the years. From out of space…. A warning and an ultimatum! It’s a great movie, of course, in the classic Science Fiction genre. And yes, it has many great themes of peace, love, mutual harmony, and so on. And by the way, diamonds in a good sense represent the highest levels of spiritual and heavenly truth, and our love for that truth. So there certainly is spiritual significance to Klaatu giving the boy two diamonds in exchange for a measly two earth dollars. The figure of Klaatu in the movie is also used as a Christ metaphor, as discussed in the “Metaphors” section of the Wikipedia article on the movie. Somehow, that just doesn’t strike me as all that peaceful! And where is the justice in destroying the innocent along with the guilty? Though the movie does have strong messages of global peace and understanding, I think it suffers from an idea common to the twentieth century, and by no means absent from the twenty-first: that human beings can be forced into goodness through external threats and pressures. By now we’ve seen the results of many governments around the world that have attempted to do just that. And though most of those governments have now fallen, the remaining governments of earth still haven’t entirely shaken the idea that we can at least try to make people good through the use of externally imposed laws, strictures, and penalties for those who don’t comply. Unfortunately, about the best we can do is put the brakes on people and organizations that would do bad. And even with that we’ve been only partially successful so far. As for making people good, that can happen only from within the people themselves, and from God’s presence in us individually and as a society. People cannot be made good by externally imposed threats and pressures. So although I still enjoy that movie, I’ve always felt that it embodies an inherent contradiction both within itself and with the reality of how human beings and human society actually work. Incidentally, in the movie Klaatu says he has traveled “about five months . . . your months” to get to earth, and that in that time he had traveled “about 250 million of your miles,” presumably from his home planet. By my calculations, that’s too far for him to have come from either Mars or Venus (both of which are suggested in the movie) even if they were on the opposite side of the sun from earth, but not far enough for him to have come from Jupiter, which is about 390 million miles from earth when the two are at their closest approach to each other. So the only (known) place his planet could be is in the asteroid belt, which occupies a band 186-370 million miles from the sun, or 93-277 miles out from Earth’s orbit on a direct radius from the sun. To travel that distance in five months would mean an average speed of about 70,000 miles per hour—which means Klaatu’s spacecraft traveled at speeds well within today’s human technological capabilities (see: “Top 10 fastest man made objects ever”), though faster than anything human-made had ever traveled when the movie was made in 1951. Some other thoughts here regarding the ‘contamination’ of technology vis a vis what Swedenborg saw and Fermi’s Paradox. My take on this is perhaps a bit ‘different’. While willfully less materialistic but more spiritual alien civilizations could explain the lack of radio signals I don’t completely agree with the underlying premise. There are problems with it IMO. IMO this premise connotes that technology (essentially knowledge) tends to evolve into something anti-spiritual. I find that to be too simplistic. I for one find it very hard to swallow that alien civilizations willfully refuse to create advanced technologies simply because they preferred to be Luddites as it were. The biggest problem with this premise is that it essentially puts the cart before the horse. IOW it presupposes that they would already know that advanced technologies are inherently anti-spiritual before having actually developed them first and to then after having once developed these technologies learn that it causes too many spiritual conflicts. In effect that would mean such once advanced alien civilizations would willfully ‘dumb down’ to get closer to the divine. I just don’t buy it. I think what Swedenborg saw was intentionally limited due to what he could handle mentally and spiritually at the time. I think he wasn’t shown advanced civilizations nor their technologies because it would’ve interfered with the principal simple directive of his overall message – to better explain the hidden meanings within the bible, to better understand the real nature of the divine, and that there is an afterlife. Back to TDTESS, to me again one of its most profound messages is that technology or for that matter material wisdom is not inherently anti-spiritual but rather evil itself is. It’s what you do with that knowledge that is key. I for one hope that the message Swedenborg conveys (nor unintentionally through you) is not to alienate those who are intellectually curious about material things within all the sciences but rather that both can co-exist even in heaven. Fo many of us I am quite certain that although a life in heaven principally serving one another is all fine and good, eliminating the cerebral growth facilitated through knowledge obtained in all the sciences is disconcerting. IOW I don’t think God wants us to be so spiritual that we also stop advancing cerebrally either. Yes, perhaps materialism complicates becoming more spiritual but as Swedenborg also understood the two can be balanced to still accomplish what God wants us to become. What I’m ultimately trying to convey is that being Amish, a monk, essentially a Luddite, doesn’t necessarily mean you inherently get closer to God – and the same goes for alien civizations. All it means is that PERHAPS one will be inclined to be less distracted from those things that are spiritual. But again as Swedenborg so aptly demonstrated also pursuing technological things can support understanding and appreciating spiritual matters to even greater degrees. I don’t want to fear science. And I don’t want to fear materialistic learning. Ever. But instead I fear losing any spirituality I still may have while still learning those materialistic things. If you fear that even while being as scientifically brilliant as Swedenborg was for his day then IMO you have indeed learned better to love God, your neighbor, with all your heart, soul, and MIND. I’m not there by any means it’s just something that strikes me as true. First, I view Swedenborg’s (pre-)solution to the Fermi Paradox as a theory rather than as an established fact. As you can see spelled out in my article, “Do the Teachings of Emanuel Swedenborg take Precedence over the Bible?” I view Swedenborg’s theological writings as intended primarily to convey spiritual truth about God, the spiritual world, and our spiritual life and growth. The science in his writings is, I believe, intended only to serve as a means to communicate and illustrate that deeper, spiritual message, not to be an authority on material and scientific truth. In fact, although so far the evidence seems to fit within Swedenborg’s idea that the cultures on other planets haven’t developed high technology, I find it rather unlikely that in all this vast universe, there are no other intelligent cultures that have developed technology. Just by the sheer numbers involved, there should be at least a few other materialistic cultures that develop material science and technology, as the people of our earth have done. So I tend to think that there are other technological races out there, but that they’re not the most common type of extraterrestrial culture. If I’m right about that, cultures that produce radio signals that we can receive may simply be rarer than we earthlings expect, given our general belief and expectation that every intelligent culture would inevitably develop technology. If our SETI efforts started detecting radio signals from alien races, or discovered technologically developed extraterrestrials in some other way, I would find that fascinating and exciting! But as I’ve said in other comments, I think it’s best to build our theories based on what we do know rather than on what we don’t know. And so far, despite a fair amount of effort, we haven’t detected any signs of technologically advanced extraterrestrial life. That’s what suggests to me that Swedenborg may actually have been right about the generally non-technological nature of the inhabitants of other planets. I really do hope to live long enough for the first evidence of extraterrestrial life to be discovered. When it comes to what goes on in this material universe, I look primarily to science to provide reliable information. And life of any sort existing elsewhere in this solar system or farther out in the universe would be a very exciting discovery! Second, I don’t read Swedenborg as saying that science and technology are somehow inherently evil, but rather as saying that they are relatively low-level in the overall spectrum of human knowledge and activity. It’s not that the non-technological races Swedenborg describes on other planets have somehow grokked the nature of material science and technology and found it to be evil. Rather, it’s that their minds are focused on spiritual and interrelational matters rather than on physical and scientific matters, so that they’re simply not interested in material science and technology beyond what’s needed to meet their basic physical needs during their brief lifetimes in the material world. They see the purpose of their physical lives as being a preparation for eternal life in the spiritual world. So for them, spending the sort of time, energy, and effort on material science and technology that we’ve done on earth would be seen as a huge waste of time that could be used more constructively in developing their minds and hearts along spiritual lines in preparation for their permanent lives in heaven. I’m aware that among many materialistically-leaning people, “science” is synonymous with “knowledge.” But I would say, rather, that science as practiced here on earth is synonymous with knowledge about the material universe. If, as Swedenborg said, and as most other religiously-oriented people also believe, there is another entire realm of reality beyond the material universe, called generally “the spiritual world,” or perhaps better, “the spiritual universe,” then knowledge about that realm is surely just as important as, if not more important than, our knowledge about the material universe. That is, if we’re going to spend eternity in the spiritual world after a relatively brief time in this material world, it is more important. Among atheists and agnostics, and even among many religious people, material reality is seen as the reality, while spiritual things are seen as wispy and insubstantial, or as entirely non-existent. But according to Swedenborg, and also according to many others who have experienced the spiritual world through near-death experiences and other spiritual experiences, the spiritual realms are actually much more real, vast, detailed, complex, and intricate than anything we see here in the material universe—including the whole vast sweep of stars and galaxies. In other words, it’s not that these people from other planets are luddites who eschew knowledge. Rather, it’s that the knowledge they pursue is of a higher order than the knowledge that we on earth generally pursue. Their intelligence may in fact be far superior to ours, but focused instead on the complexity and intricacy of spiritual reality, which goes vastly beyond the complexity and intricacy of material knowledge. As for technology in the spiritual world, for those people who come from planets that love material science and technology, I do believe that the analogs of that science and technology exist in the spiritual world. And for people from our earth whose minds travel along those channels, there will be plenty more intellectual challenge to be had in the spiritual world. In my younger days of spending many hours reading science fiction, among the stories of space ships and advanced technology, there were also stories of alien cultures that seemed to live simply and have no technology at all, and yet that turned out to be far more intelligent and powerful than the earthlings who visited them in their interstellar space ships. In one such story, whose title and author I can’t now remember, such a race explained to the earthlings that they once did develop technology as the people from earth are now doing, but that they had long since left it behind for higher pursuits. And yet, they had developed the ability to influence and control material reality through the power of their minds, such that they had no fear whatsoever of the earthlings’ “advanced weapons,” but could easily defend themselves from attack by warlike technological races. Swedenborg, similarly, describes the highest angels as living very simply, often dwelling in tents and going naked in their own communities, such that from a distance they look like little children playing together due to their innocence and simplicity; but as having such power (from God, of course) that a single one of them can easily send thousands of evil spirits fleeing in terror should those evil spirits ever approach their communities with any intent to do harm. He also says that though these angels seem childlike, simple, and even unintelligent to lower angels, in fact their intelligence and wisdom so far surpasses that of the lower angels that there is no comparison. They instantly perceive and understand things that lower angels must spend great time and effort studying and learning. And they are able to think on a level and comprehend depths of spiritual reality that go entirely beyond the capacity of angels of the lower heavens. An interesting take on TDTESS. Kind of like Klatuu having a hammer in a velvet glove. I guess where I detour from that being contrary to being peaceful and hence not truly spiritual is that AFAIK being defensive is no sin. I think that’s where Klatuu’s coming from in the sense that if earth indeed was about to destroy his planet and others, then his civilization would destroy us first given no other choice. I believe that’s the inherent message. To wit, even God apparently uses fear of punishment at times to deter a greater evil. Anyway, it’s a great movie, not perfect of course in certain aspects as you point out, but great nonetheless and worth watching again. I wanted to say something to you but left it for now. I believe that the hardest thing to do in all the material universe isn’t technological in nature. I think the hardest thing to do in both this material world and the highest realms of heaven is to love even when someone treats you constantly like worthless crap. IMO it is relatively easy in comparison to serve and love one’s neighbor when they in turn do the same for you. I understand that’s the gestalt of Swedenborg’s description of what heaven is generally about and that state is what essentially makes it a wonderful place to be. I can see that. I also think that the highest realms of heaven are not quite this simple though. Since Christ was at least certainly part of that highest realm I can deduce that to love when one is not loved in return is the greatest difficulty of all. All I know is that loving my neighbor when he or she acts like a complete inconsiderate jackass is something I can’t nearly pull off yet. To be honest, I have severe doubts that I ever will pull that off. I understand about self-defense. But given that the robot was quite capable of destroying the surrounding army’s weapons without killing the soldiers themselves (though it did kill a couple of soldiers in the course of the movie also), the robot police would surely be capable of neutralizing the human threat to other planets without incinerating earth and killing every living thing on it. Legitimate self-defense goes only as far as is needed to neutralize the enemy threat and ensure the safety of those being protected. Yes, loving and serving those who hate and abuse you certainly is one of the greatest tests of one’s character and commitment to good. That, in fact, was precisely what Christ himself was faced with during his years of active ministry, and especially at the time of his crucifixion. His example also shows that “loving and serving” people doesn’t necessarily mean being nice to them as usually defined today. He could be quite tough on those who attacked him—which is one of the reasons they decided he had to die. “Tough love” was not invented in our time. It goes way back. And about the angels, though most of them do seem to live and interact primarily with people in their own angelic communities, Swedenborg does describe angels whose jobs involve meeting people arriving from earth, who often end out rejecting them. He even describes angels whose jobs are to be essentially prison guards, overseeing various hellish communities and making sure that their evil schemes and actions don’t get out of hand. So although dealing with people who hate you and would love to kill you isn’t everyone’s cup of tea, even in heaven there are those whose jobs involve dealing with evil and destructive people. I can fix those typos if you want. Hah! Yes indeed. We’re actually not inconceivably far off from building The Terminator on earth. All that’s really necessary is to take AI up a quantum notch. The mechanics IMO are already somewhat feasible. It’s the big brain that’s missing. TDTESS’s robot is THE dream of generals! Could you please expand a bit on your comment that “loving and serving” people doesn’t necessarily mean being nice to them as usually defined today? I guess I’m wondering what the main difference is between being nice back in Christ’s time vs being nice today. The principle is the same whether we’re talking about Christ’s time or talking about today. It’s just that today there’s an especially strong idea that all people should be treated equally, and that therefore we should make no distinction between “good” people and “bad” people when doing our good works of love and service to others. Of course, we need to read that with some nuance. But the general idea is the same as what’s now common knowledge: If you give money to a panhandler who’s an alcoholic or drug addict, it’s just going to go to alcohol and drugs, which really doesn’t help the person at all. So we should use good sense in determining whom to help, and how to help them. If our “help” actually causes more harm than good, is it really loving and serving people? If we help criminals to avoid the consequences of their actions, our “help” is actually causing harm, both to the criminals’ victims and to the spiritual state of the criminals themselves. If we invest in a company that produces harmful products such as cigarettes, our “help” is actually helping that company to destroy the lungs and the lives of its customers. So we need to be intelligent about how we love and serve other people, and consider whether our good deeds will actually lead to good, or will, rather, give wrongdoers more power to do wrong and harm others—which would mean that by extension we are harming others. So it must’ve been a rather poignant and not so unrealistically ironic movie to B&W audiences even back then considering those nuke events. Yes, The Day the Earth Stood Still is certainly a period piece. It reflects both the hopes and the fears of the post-WWII era. As in all science fiction, the aliens are really reflections of various aspects of the human psyche, and of issues in human society. Klaatu’s internal contradiction between coming in peace while threatening the total incineration of earth is a reflection of the great contradiction of the age: a desire for global peace and harmony as reflected in the formation of the United Nations immediately after WWII in order to prevent any more world wars from happening; and during the very same post-war period the development of the doctrine of Mutual Assured Destruction (MAD)—that if attacked, each major player in the great global conflict is willing and able to incinerate its enemies with nuclear bombs—and in the process most likely destroy the entire earth for human habitation. The idea is precisely that of TDTESS: that the alternative to peace is so terrible that no one would dare risk it. In the post-WWII era the “post-apocalyptic” genre of science fiction gained a huge boost in a whole new and still ongoing series of stories that dealt with what’s left of earth after nuclear war. The darkest of these picture an earth in which all higher life forms are destroyed, ending human civilization. That’s exactly what Klaatu threatened earth with. But people don’t like to think about that. It’s too depressing. So the more popular entries in the post-apocalyptic genre portray brutish human survivors living on the wasted and contaminated desert left behind in the aftermath of nuclear war. Mad Max: Fury Road is the latest entry in this genre. Unfortunately, Mutual Assured Destruction is not a stable basis for world peace. And if we were to follow out the implications of Klaatu’s threat in TDTESS, neither would that be a stable basis for interplanetary peace. Only the development of mutual understand and respect can achieve that. And one of the best ways to achieve that is through open global (or interplanetary) trade and communication. In general, nations are not keen on obliterating their trading partners. It’s bad for business. But more than that, developing respect and appreciation for other cultures and their struggles, triumphs, and unique contributions to humanity as a whole is ultimately the only stable basis for world peace. Yes, it certainly does seem that there should be plenty of technological societies out there. And maybe we’re just looking in the wrong place. But Fermi’s paradox still confounds us. Btw the comments section is always entertaining on these types of articles.